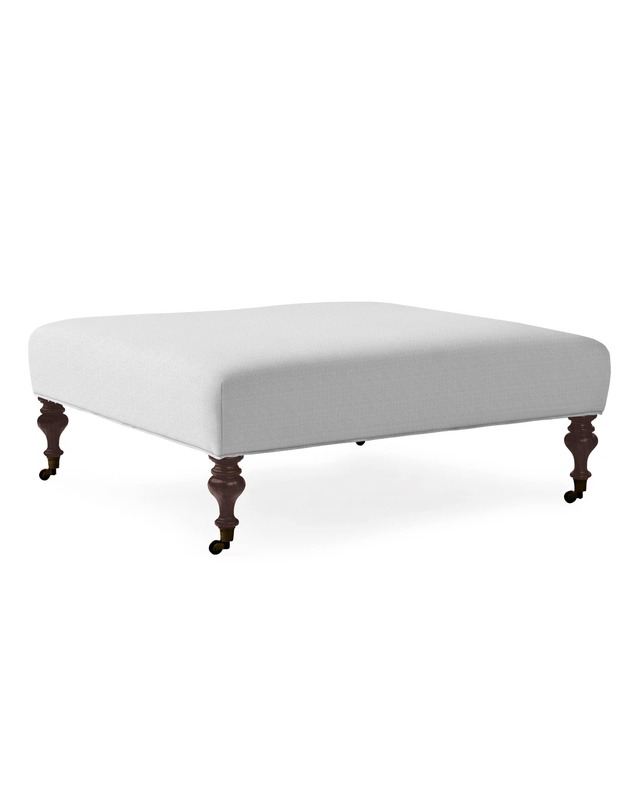 Chelsea Ottoman - Turned LegChelsea Ottoman - Turned Leg, alt="Chelsea Ottoman - Turned Leg, "
Print Brilliantly oversized and just the right height, this piece serves many functions with style. Top it with a tray for art books or cocktails. Take the tray away and it’s extra seating for guests – or a perch for tired feet. Equipped with casters, it’s ready to roll here, there and everywhere. Turned legs nod to tradition. Woven stretch webbing for long-lasting support and comfort. Seat padding made of fiber-wrapped, soy-based foam. Solid wood legs are finished with low-VOC stain in Natural, Dark Walnut or Driftwood. Also available with tapered legs. Natural Brass or Brushed Nickel casters on all four legs.